‘Unorthodox in style but rich in substance! 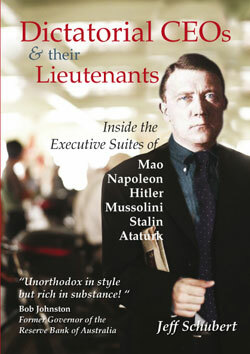 “Dictatorial CEOs & their lieutenants: inside the Executive Suites of Napoleon, Stalin, Ataturk, Mussolini, Hitler and Mao” has so much to offer both the history buff and the psychologist; and act as a cautionary tale to the aspirant to power. The age-old relationship (tension) between master and servant is taken to a new high: in this case to that between tyrant and subordinate. What is it in the genes that drives the tyrant? This book identifies and documents elements in the character of several of history’s towering despots (“The Man”) and finds correlations (“commonalities”) across the group. It examines, if not the genetics, then their powers, ambitions and modus operandi. Subordinates rarely rate more than footnotes in historical studies of such tyrants, but here motivations and actions of the lieutenants are extensively noted and compared. Once again there are commonalities that highlight the universal nature of human beings; and how desires and fears can lead people to serve a despot. Since the book eschews judgment and moralizing and is about what is rather than what might be, the text here is somewhat Machiavellian. Overall the book serves to reinforce the importance and proper forms of accountability in political and business life’.